Five thousand years ago, there came to earth a magical being called Krishna, who brought about innumerable miracles for the good of mankind. Humanity despaired for its fate if the Blue God were to die but was reassured that he would return in a fresh avatar when needed in the eventual Dark Ages - The Kaliyug. In modern times, a poor little rich boy grows up believing that he us the final avatar. Only, he is a serial killer. 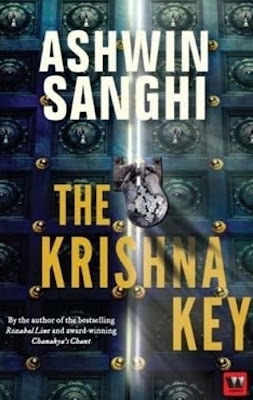 Historian Ravi Mohan Saini must breathlessly dash from the submerged remains of Dwarka and the mysterious lingam of Somnath to the icy heights of Mount Kailash, in a quest to discover the cryptic location of Krishna's most prized possession. From the sand-washed ruins of Kalibangan to a Vrindaban temple destroyed by Aurangzeb, Saimi must also delve into antiquity to prevent a gross miscarriage of justice. *pause* I need a breather. I mean, what on earth was that??? I am still reeling under all the information and surprises and facts and fiction that Mr Sanghi has come up with in this book. This is a stellar tale. A stellar, spell-binding, guaranteed-to-keep-you-awake-all-night book. I generally don't read Indian fiction authors. When a big publishing company like Hachette sent me a book called something like When-we-met-kya-life-hogi-set, I knew it was rock bottom. To be honest, I've never even read Ashwin Sanghi before. But with all the hype surround this new release, I decided to give it a try. And the result was an all-nighter with THE KRISHNA KEY. Ashwin Sanghi is India's answer to Dan Brown. There's no doubt about that. The reason I'm saying this is because of the tale he has written and also how he has written. Hold on to your seats folks, this is going to be a long and a lil bit different review. First of all, we have our hero, Ravi Mohan Saini. He's a history professor/historian/history aficionado who's a hybrid between Robert Langdon and Jason Bourne. This is one reason why I said Ashwin Sanghi is our Dan Brown. R.M Saini is the proverbial Langdon. He's brilliant, has a nose for finding out conspiracies and connecting the dots and he's chased all over the country by the Police and the enemy. Oh! How do I even begin to review this book? The amount of twists and turns and conspiracies and facts is mind boggling. If you've thought after 20 odd pages, you know how it is going to be....think again. Mr. Raini is framed for the murder of his friend, a renowned linguist, Anil Varshney. Anil was found murdered in his own apartment in a bizarre way. He was knocked unconscious and then a scalpel was thrust in his left leg and left to bleed out. 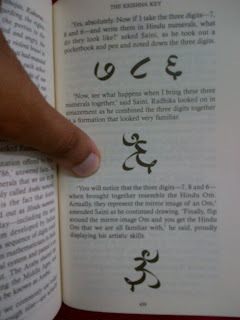 Also a symbol was stamped into his forehead and a Sanskrit verse written on the walls. Getting a deja vu of Langdon in Angels and Demons?? Yes, I thought so. But even Robert Langdon won't be prepared for a ride that our Ravi Mohan Saini has found himself in. Arrested and then staging an escape from right under the noses of the Police, our dashing young hero is on the run to find the killer, to solve the murder of his friend and escape the closing net of the Indian law enforcement. And then, the person he runs to is killed the same way as his friend. The nightmare begins again. Ravi's friend, Anil came into possession of four seals of the same type. Those seals are what now is known as the identification mark that every citizen of Dwarka carried. Yes, the same Dwarka that Krishna created. And if it's verified, the conclusive proof of Krishna and even the Mahabharata would be real instead of just mythology. But someone far more devious is after those seals for a secret, that's far more dangerous. Ok. I'm not going to reveal the entire plot. No, that's for you to find out. Its fast, its full of surprises and its mind-numbing! So I'll just discuss the book and some of the astounding topics it touched. Dwarka is real?? The book has even gone far to say that the fabled city of Atlantis might actually be Dwarka. And believe me Ashwin Sanghi manages to make that believe as well. Okay forget the glorious city that Krishna built. Heard of Noah's Ark? It might be connected to Krishna as well. How?? Oh GO READ THE BOOK. Am still in utter shock. And the shocks continue. Krishna, the eight avatar of Vishnu might have left behind something that's world threatening and oh, the seers who wrote the Vedas, they knew of nuclear energy and the bombs at Nagasaki and Hiroshima might not be the first ones. Even the creator of the Atomic bomb admitted that. Also, huge radiation levels in various places of India where there are temples of Shiv made me jolt. Whaaat??? I've stopped guessing which is fact and which is fiction because apparently Mr. Sanghi wants the reader to blow themselves up. Wow! Our reluctant hero, Mr. Saini races to slopes of Mount Kailash to find the final piece of the puzzle. Hold on!!! Mount Kailash, the abode of Shiv, might be a man made creation. Wo_Oh!! Exactly! But boy o boy, you will love the way Mr. Sanghi explains it to you. Damn, I need to google this stuff up! Although a particular chase did bother me and I've no idea why its there. The chase to Mount Kailash and the Somnath Temple when the villian of the story already knew that the stone was not there. Did I say stone?? Actually its the Philosopher's Stone. As I was reading that I thought maybe Voldemort made a mistake going after the stone in Hogwarts when he could have found one in India. The Indiana Jones-esque adventure comes to a thrilling end in Agra. And before it ends, you're to be bowled over again. The Krishna Key is located where there is a harmony among the Muslims and Hindus. A place where something creation and destruction resonates. Coming to the other points in the book, I loved the paragraphs of Krishna at the beginning of every chapter. It made me remember those Sree Krishna and Mahabharata shows that used to air on DD Metro. That was one of the best touches in the book. The climax on the other hand was slightly anti-climatic. For me, atleast. But nevertheless, it was awesome. A slightly Paulo Coelho philosophical deduction but it had to end in a way and maybe this was the best. Thank God, for less romance. Other Indian fiction authors really need to take a cue from Mr. Sanghi. Too many information in the book perhaps....I've lost count of the number of things I heard for the first time and never thought of before. All in all, a top class read. The references and acknowledgments alone fill up 11 pages. If that is how much I need to research before I write a book, I doubt I'll be a writer anytime sooner. I agree with what you said about the climax, the build up was more intense in my opinion! And the 786 thing was so interesting. :D And awesome! Amazing review!!! Totally agree with you when you say that you are no longer able to distinguish between fact & fiction..The author leaves you reeling with so many twists & shocks..And since you haven't read Ashwin Sanghi, I would suggest-The Rozabal Line..it deals with Jesus surviving his crucifixion & settling in Kashmir!! !